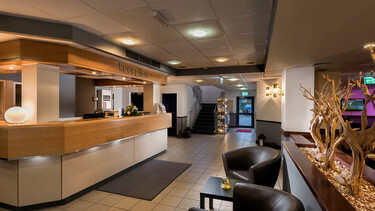 The Best Western Hotel Cologne Airport Troisdorf is ideally situated between the cities of Cologne and Bonn and has excellent transport links to Cologne Bonn Airport (9.6 km), the Cologne Exhibition Centre (19 km) and Bonn city centre (13 km) via the A59 motorway. This hotel is particularly popular with business travelers and holidaymakers who stop over in Cologne. Featuring 88 rooms, this friendly hotel offers excellent service and a pleasant informal atmosphere. Parking spaces are available in the hotel grounds for a fee. Our guests particularly enjoy the breakfast buffet in our business hotel in Troisdorf. We offer regional and international dishes for tour groups, conference guests and private functions. Light refreshments are available in our hotel bar where you can also enjoy a fresh draught beer or a glass of fine wine in a pleasant atmosphere. In the summer, our sun-drenched beer garden is a delightful place to dine. Guests staying with us have good access to the city centres of both Bonn and Cologne. In Cologne, the Kölner Dom (Cologne Cathedral) is of course a must-see; it is also worth taking a stroll through the bustling shopping streets. Beethoven’s House, the city centre of Bonn and the old market square are all interesting places to explore. Phantasialand theme park in Bruehl, and the Chocolate Museum are popular with families. And if you are looking for somewhere to unwind, Claudius Therme spa is an oasis of relaxation. Owing to its good transport links to the city centres of Cologne and Bonn as well as the airport, the Best Western Hotel Cologne Airport is one of North Rhine-Westphalia’s most popular conference venues. Our four conference rooms measuring between 25 and 80 m² can accommodate parties of up to 75 persons; they are all fitted with modern conference equipment and air conditioning and have plenty of natural daylight. Movable sound-proof partition walls offer maximum flexibility. The Best Western Hotel Cologne Airport Troisdorf offers spacious hotel rooms measuring up to 30 m². The modern room fittings include a queen-size bed, desk, Sky TV and spacious bathroom with generous shower area. Our business-class rooms are quietly situated and offer business travelers and holidaymakers the added bonus of a Nespresso coffee machine, air-conditioning plus a separate seating area. 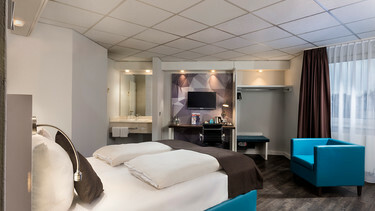 In all rooms at the airport hotel Cologne you use WiFi free of charge. You depart in the early morning from Cologne Bonn Airport to start your holidays? Or you want to relax completely in in the thermal baths in Cologne Claudius Therme? We have the perfect offer with overnight stay and all-inclusive service at Best Western Hotel Cologne Airport Troisdorf. During your stay in Troisdorf, you should not miss a visit of the city centre Cologne and a sight seeing tour of the city. The Best Western Hotel Cologne Airport Troisdorf gives you the most important sights and some insider tips for your trip to Cologne and Bonn.